Every Easter, we at Blair Candy discuss Reese’s, Gardner’s, and other chocolate peanut butter candies a whole lot. Well, there’s nothing wrong with that! Easter is a time of many wonderful candies, and chocolate peanut butter sweets are usually right at the tops of people’s lists. But we also know how much our fans enjoy lollipops in bulk all year round, and we don’t want you to lose out on your favorite candies just because it’s Easter. To solve that problem, we’ve got some lovely Easter lollipops for you! As you can see from the attached image, they’re all decked out for the holiday! In each box, you get 12 lollipops that are 8 inches long from one end to the other. Each lollipop here is made of tasty swirled hard candy and is shaped, appropriately for Easter, as either an Easter bunny or Easter egg! Either shaped lollipop will look great in someone’s Easter candy basket. Or you can hand these out at a church or school event this spring. 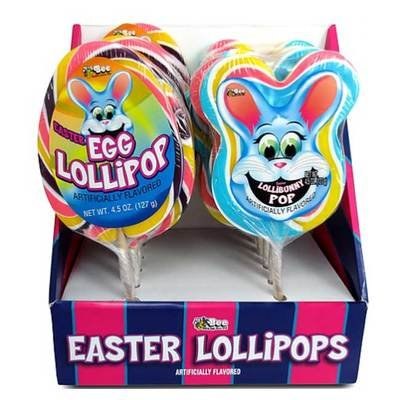 These Easter lollipops in bulk are a delicious way to enjoy novelty Easter candy this year, so be sure to order yours before it all sells out! Keep shopping all Easter candy now on BlairCandy.com, an experienced retailer of wholesale candy!